This year His Majesty is a Triple stout porter, in a the big 750ml bottle that has beer of 9%, which is 270 calories a serve size, and 5.3 standard drink units in total. This year’s His Majesty is a straight-edge homage to nevaRRaven and The Last Dictator –two very popular strong dark ales we’ve brewed in the past few years. Without the judicious hopping of the former, or the Botrytised twist of the latter, it’s the beer that showcases the rich Weyermann malts we love so much. Drink now or cellar for up to five years. What could possibly go wrong? Well I’m no where near keeping this for 5 years. That would take real willpower. I overcame my willpower. Dark rich chocolate pungent aroma on opening, which it did with a decent hiss. And I can’t pour a decent beer, this has a head like an milkshake. Aroma settles into a more sour cherry fruit thing, with a chocolate thing that lurks around as well. It’s a very dark beer and the head is like foamed ice-cream sundae, it’s almost too good to drink. It’s not too good to drink. That has a lot of chocolate malt in it, and it’s bitter and very dry, very dry. The dark aromas engage your nose before your tongue, one of those forewarning beers, which is nice, but the aroma settles to a more sour note than a steeped or infused fruit one. The chocolate note gone altogether. The taste though, even though this is barely warmed since opening is already settled into a more mellow and balanced profile with the fruits presence at the front and a slight bitterness and the dryness abated. It’s become very quaffable. Which raises a red flag, as this is beer to get squiffy to at that ABV, of which there is not a lot of indication. The chocolate and sweetness in the front of this beer just draw you in so quickly. That and of course I’ve been looking forward to this for a while now, I waited months for it to be available only to wait months to drink it, it’s not a treasure it has to be drunk of course. I really do like how this calms down around the edges and just becomes a bit more rounded and whole as it warms. I might have mentioned that already. The pdubyah-o-meter rates this as 8 a of its things from the thing. I think is very good, but just doesn’t get to great or marry me. 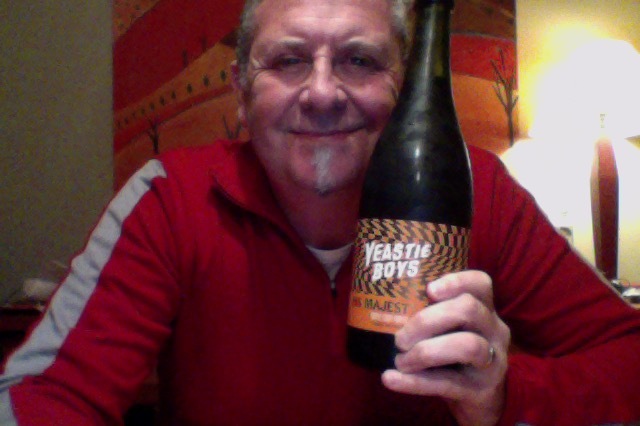 It’s a very nice beer, and yet again the Yeastie Boys have come up trumps. Am I enjoying it? It’s a beer to drink into and enjoy more as it becomes less. Would I have another? I think I would, it’s nice and worth seeking out. Would I share with a friend on a porch and set the world to rights? It’s a very good Porter and I think that it would open an avenue about the merits of the style and what you could expect. Might take a couple of bottles. Music for this, well Paloma Faith (born Paloma Faith Blomfield, 21 July 1981) is a British singer, songwriter and actress, known for her retro and eccentric style, Seems fitting. Listen on the Spotify, or where you listen otherwise. Some of it is real pop and some is real retro 80’s style dance floor dance music. Some of it is nice. Imperial or extra-strong porters fall in between the traditional porter, a Baltic porter, and an imperial stout. They range from around 7.5% upwards, with hefty dark malt character, but lack the overt roastiness of an imperial stout. 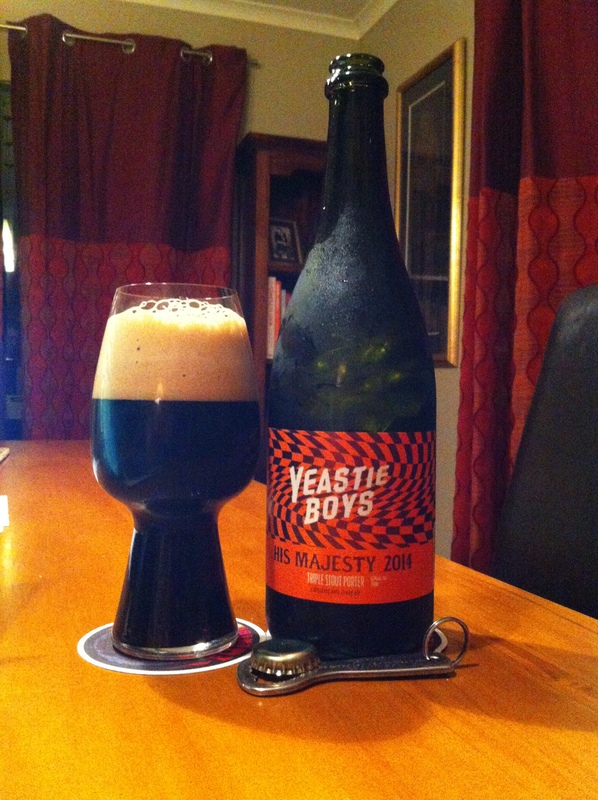 This entry was posted on May 9, 2015 by Philip Walter in Beer, Beer of New Zealand, Beer Review, Craft Beer, Critic, Imperial/Strong Porter, Yeastie Boys and tagged Alcohol by volume, Beer, craft beer, His Majesty 2014, Porter (beer), Stout, Yeastie Boys, Yeastie Boys His Majesty 2014.